Koh Rong is the sort of place you can spend a week doing nothing. If that’s not your cup of tea, here are the best activities on the island. There’s some surprisingly good snorkeling on Koh Rong, where a dedicated snorkeler could find sergeant fish, seahorses, parrotfish, diamond fish, jumping fish, squid, yellow boxfish, diamond fish, needlefish, blue-spotted ribbontail rays, and goatfish in the waters around the island. In years past, two of the best places to snorkel near Koh Toch were the two piers, but these days, with speed boats flying in and out all day and villagers dumping their garbage into the water, the piers are probably the worst place to snorkel. Treehouse Bungalows boasts a great snorkeling spot, and you can rent snorkel gear directly from the guesthouse. If you walk through the jungle to the bay, to the left of where the jungle path leads you you’ll come to a beautiful beach, and near the rocks are lots of fish and other sea life you can watch. If you’re hiking over from Koh Toch Beach, wear proper shoes and don’t walk by yourself — solo hiking in the jungle is not safe. Koh Rong Dive Center offers fun dives and PADI training courses on and around Koh Rong. If you’re a serious diver (or want to be one), Koh Rong is probably not the best place to dive, as the visibility near the island isn’t the best. Most dive operations prefer Koh Rong Sanloem or the islands that are further afield, like Koh Tang or Koh Prins. But if you’re looking to go diving during the day and party on the beach at night, Koh Rong is the place to do it. A three-day PADI open-water certification costs $380 and includes accommodation and food. 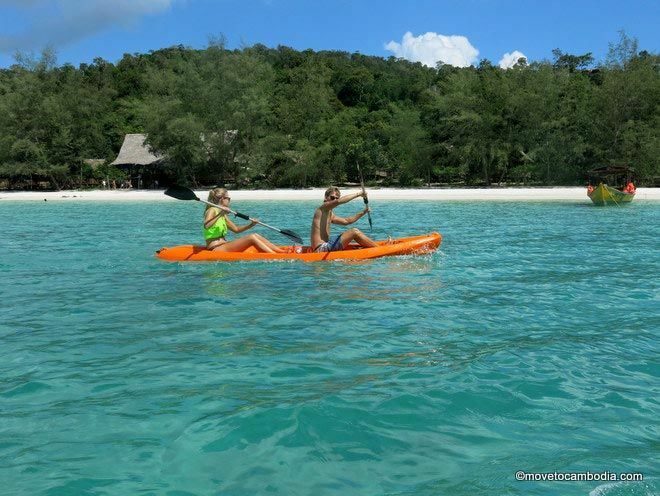 Explore Koh Rong’s beaches and bays by kayak. Kayaks can be rented by the day or by the hour ($12 or $5, respectively). It’s possible to kayak to the small island directly across from Koh Toch Beach — it’s called Koh Toch, or “small island,” but it’s also sometimes called Pagoda Island, because there’s nothing there but a pagoda and a couple of monks. You can also kayak to some of the other beaches, but be aware that the island is large and you won’t be able to go all the way around it in one day! There are usually a few volunteering opportunities on Koh Rong. Friends of Koh Rong, an organization dedicated to helping local people adapt to the changes that tourism is bringing to the island, offers short- and long-term volunteering opportunities. If you’re just there for a day or two you can participate in beach cleanups or help adults in the village work on their conversational English. More in-depth projects can be arranged for long-term volunteers. If you have special skills that you think might be useful be sure to get in contact with them, as they can probably make use of your specific skill set. 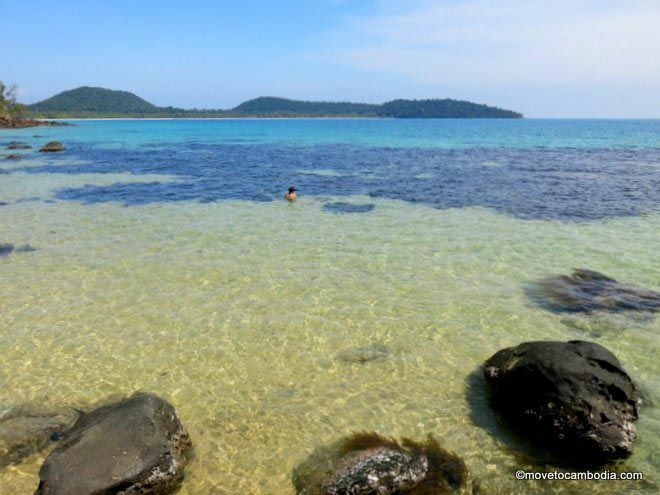 To learn more about the Friends of Koh Rong, read our interview with them on the blog. If you’re looking for something more laid-back, Inn the Village in the Daem Thkov fishing village are often looking for volunteers to work out their guesthouse, restaurant, and bar. They ask for a minimum commitment of two months, and offer free accommodation, food and drink, Khmer lessons, and discounted diving and PADI courses. Kong Rong Emergency Services, which offers the only medical care on Koh Rong, are looking for volunteer paramedics (EMTs), registered nurses, and doctors with experience in trauma situations to cover clinic hours and be on call for emergencies. Koh Rong Emergency Services provides services to villagers on Koh Rong and the nearby islands who don’t have easy access to medical care; volunteering offers the chance to make a difference while enjoying a tropical paradise. Volunteers who stay for three months or more are provided with free housing, and all volunteers get dinner every night at one of the restaurants on the island, as well as discounted breakfasts. Long gone are the days when there was nothing to do on Koh Rong. Now there’s High Point Adventure Park, a Russian-owned rope adventure park with a 160-meter zip line. The park features climbing, rope walks, and two ziplines high in the jungles of Koh Rong. It’s a bit like a jungle gym suspended in the air above an actual jungle. The views are superb and you’ll get some excellent photos, but this is probably not the best activity if you’re nervous about heights. They’ve paid attention to safety, though, providing safety equipment shipped over from Europe, and you’ll be wearing an Italian-made helmet to do the course. It’s possible to do the whole thing in flip-flops, but wearing shoes is much safer. Tickets cost $25 during low season and $35 during high season. A day spent on the beach is a day well spent. It’s entirely possible to spend a week on Koh Rong and do nothing at all. 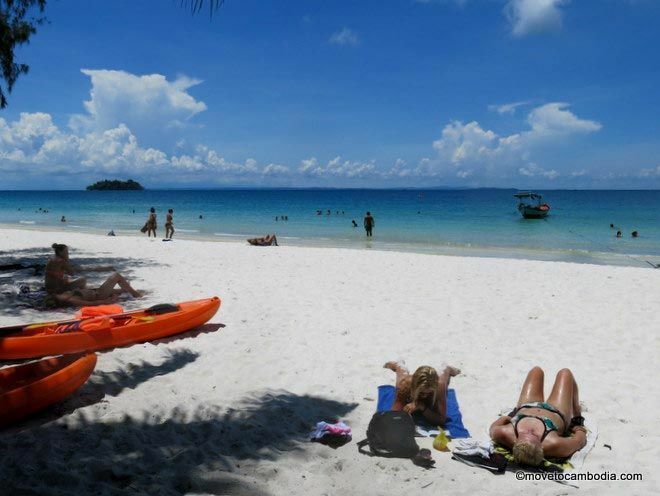 The white sand beaches of Koh Rong are some of the loveliest in the region, and the best way to fully appreciate their beauty is to lie on the beach and read a good book. There are hammocks all over the island, and once you find one, you can get stuck for hours. The turquoise waters are lovely and fairly shallow — deep enough to splash around in, but even those who are not confident swimmers will be able to enjoy themselves. On dark, moonless nights it’s sometimes possible to see the bioluminescent plankton that Koh Rong is famous for. Because Koh Toch Village has many lights, you probably won’t be able to see the phosphorescent plankton here, but further down the beach, once the lights go off, it’s possible. Even better viewing is on Long Set Beach, because there are so few businesses and the ones that are there close early. Other spots on the island, like Lonely Beach and Coconut Beach, offer even better viewing for the same reason. Adventure Adam Tours offers tours around Koh Rong. The full-day island tour is the most popular, and goes from 9 a.m. to 7:30 p.m. every Monday, Wednesday, and Saturday. The tour costs $25 and includes snorkeling on several beaches, including the beautiful and secluded Lonely Beach, fishing, visiting a local village and meeting some of the families there, a sunset cruise and once it’s dark, swimming with the bioluminescent plankton. Tours include meals and drinks and a healthy dose of island knowledge. Private tours can also be arranged, as well as multi-day tours. This small, eclectic zoo will be of interest to animal lovers. 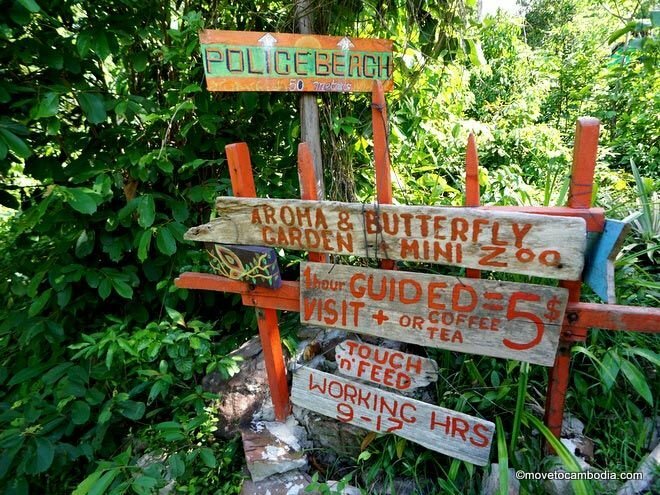 There’s a small butterfly farm and mini-zoo on Koh Rong near Police Beach, run by Olga, a very interesting Russian woman who escaped the rat race back home and is clearly very enthusiastic about animals. She’s cobbled together a collection of exotic poultry, birds, butterflies, and wildlife, including civets, a monitor lizard, and a surprisingly tame bat. She’s also an avid gardener and has been turning her little patch of jungle into her own version of paradise. She offers guided tours for $5 that include a coffee or tea and the chance to touch the animals. Hours vary depending on her schedule — when we last visited she was staying up nights to try and catch a python that had been stalking her poultry — but she’s usually there between 9 a.m. and 12 p.m.
Koh Rong has not one but two tattoo parlors these days, which offer the opportunity to get the staph infection of a lifetime. The conditions on the island are far from hygienic, so we shudder to think of walking around with a large open wound there, but we leave it to you to decide for yourself. We’re similarly skeptical about the large selection of happy cookies, as well as the harder drugs being sold out of the less savory businesses, although this seems to be a favorite Koh Rong activity for some. We aren’t your mother, but remember that this is illegal even in Cambodia and there have been several drug-related backpacker deaths on Koh Rong. If you are just on Koh Rong to party, you’ll have no problem giving your liver a workout. Every Thursday and Sunday there’s a Koh Rong pub crawl that leaves from either Monkey Island or Skybar at 8 p.m. Tickets cost $8 if you buy them in advance or $10 at the door. Participants get a free T-shirt, a shot, and the chance to drunkenly traipse around Koh Rong getting hammered. The crawl’s organizers advertise flip cup, beer pong, and hot staff, plus free shots at every stop. On Saturdays there’s an all-night party on Police Beach with a fully-stocked bar and a soundtrack of techno, drum and bass, and deep house. The party goes from 10 p.m. until sunrise. Admission is $7.50 in advance or $10 at the door, and includes a free beer if you arrive before midnight. Popular full-moon parties are also held on Police Beach and attract hundreds of revelers every month from 10 p.m. until sunrise. When the sun comes up, there are boats to Long Set Beach where the party continues at Sky and Sandbar. Tickets to the full-moon parties cost $10 in advance or $15 at the door and include a free beer before midnight.